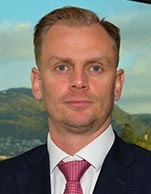 Bjørn Kristian Røed oversees Odfjell SE's research department that studies the chemical tanker market's short and long-term trends. The research is further used for strategic planning and decision making in Odfjell SE. The research is done in close cooperation with employees in Odfjell's 17 offices worldwide that gives a unique insight into the global chemical markets from a shipping and tank terminal perspective. The role as a researcher is combined with him heading Odfjell SE's investor relations department. Prior to joining Odfjell SE, Mr. Røed was a shipping analyst in the investment banking department of Danske Bank Markets, Terra Markets and Nordea Markets where he covered various shipping companies and segments for nine years. Mr. Røed studied Financial economics at Norwegian School of Management and Singapore Management University, is 35 years of age and resides in Norway.